Home / News / The moment a MAN in a burqa and a woman in a motorcycle helmet walk into an Australian bank to test how security guards will react - so can YOU guess what happens next? 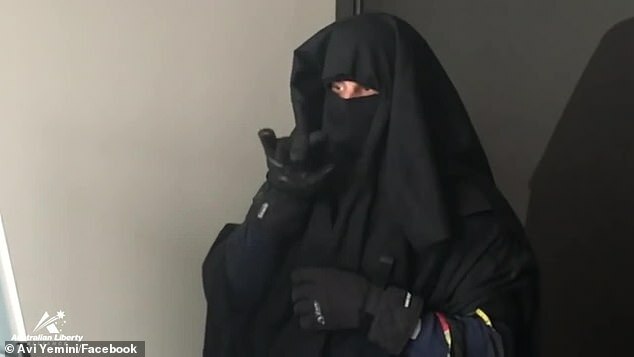 The moment a MAN in a burqa and a woman in a motorcycle helmet walk into an Australian bank to test how security guards will react - so can YOU guess what happens next? A man in a burqa and a woman in a motorcycle helmet have walked into a Melbourne bank to make a point about political correctness. At that point, Mrs Robinson told him she the double standard was ridiculous. 'I think it's really unfair I have to take this off and people can walk around with those on,' she said. The conservative Jewish activist, who campaigns against Islamist extremists, mocked the security guard for being politically correct. 'You're a good man for standing up for multiculturalism,' he said. Like One Nation, the Australian Liberty Alliance is in favouring of banning full facial coverings in public.